A portion of Politico's transcript of a press conference where President Trump defended white supremacists and the alt-right said the president referred to those groups as “us” — but a review of the audio doesn't back that up. In Tuesday's press conference, Trump said both sides that gathered in Charlottesville over the weekend were responsible for violence — in spite of eye witness accounts, photos, and video that showed white supremacists, white nationalists, and alt-right supporters arrived ready to fight. Trump asked reporters why they didn't pay more attention to violence coming from supporters of the left. “OK, what about the alt-left that came charging them? Excuse me. 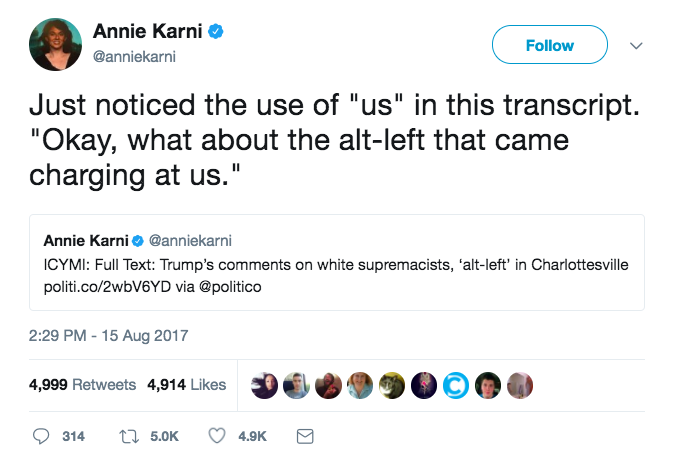 What about the alt-left that came charging at the — as you say, the alt-right? Do they have any semblance of guilt?” Trump asked, according to transcript created by Federal News Service. Politico's first version of the transcript, however, suggested that Trump considered himself part of the white supremacist and alt-right faction of the rally.